Since the foundation of the company in the year 1879, Hartner has been engaged in the development and production of high precision products. We are following this tradition even today. Today’s product range consists of cutting tools for many different applications. Besides classic drills made of high speed steel and solid carbide, we offer intelligent solutions such as the high-performance reamer TR 300 HP or end mills with innovative geometries and in-house made coatings. 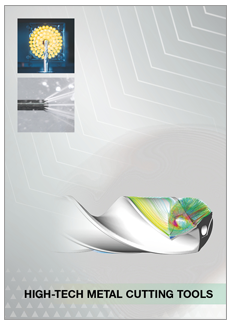 This means up-to-date solutions especially for high performance machining. Special tools as for example in the field of gun drills, step drills and end mills complete our product range. We are also your partner for high technology machining with PCD and CBN tools. The history of HARTNER GmbH starts in the year 1879. At that time, Ferdinand Rehfuß at Ebingen founded a company for manufacturing precision scales and weights. In 1893, Gustav Hartner took over this plant and continued the production of scales and weights. 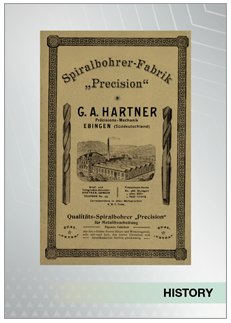 In 1911, Gustav Hartner takes an important decision: He extends the product range of Hartner company to precision drilling tools. From 1913, this programme extension is also part of the company’s name: G. Hartner, Factory for Scales and Drills. The necessary special machines for the industrial production of drills are produced by the own machine construction department. The production of precision drilling tools and equipment for manufacturing these tools becomes more and more important for Hartner, and is developing to the most important part of the company. Today, Hartner’s range consists exclusively of precision cutting tools. The standard range includes more than 21.000 tools for many different applications. Furthermore, Hartner is producing special tools as per customer’s request. Up-to-date tools with high efficiency and precision need quality in every detail. Therefore, Hartner is using only first-class raw materials. We exclusively use steels of high quality and select the carbide grade depending on the application. For coating we can choose between different hard coatings. Hartner constantly does research on new coatings. After a successful testing phase, the new TiAlSiN hard coating has been launched in 2012. It is an extremely wear-resistant coating with a hardness of 5500 HV. In 2017, the AlTiZrN-coating has been used for the first time on a stainless steel drill. Due to the nano structure, it shows a high degree of hardness and strength. The Zirconium content of the top layer is meant to minimise chemical reactions with the workpiece material and thus supports the chip flow. The manufacturing of drill geometries on partly self-developed machines guarantees highest quality. Up-to-date technology is a condition for our modern techniques of manufacturing. 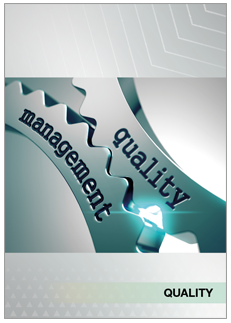 Continuous control secures the high constant quality of Hartner tools. This is not only valid for our standard tools, but also and especially for special tools made upon customer’s request.